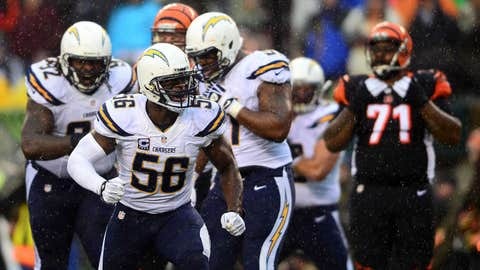 San Diego Chargers inside linebacker Donald Butler celebrates after a sack during fourth quarter of the AFC wild card playoff football game against the Cincinnati Bengals at Paul Brown Stadium. CINCINNATI (AP) — The last time the Cincinnati Bengals won a playoff game, it was in another century in a stadium that has since been torn down against a team that no longer exists. The latest letdown came Sunday when the Bengals turned the ball over four times and lost a halftime lead to fall to the San Diego Chargers 27-10 in a rainy AFC wild-card playoff game at Paul Brown Stadium. This was supposed to be the franchise’s year to finally end its lengthy postseason drought. Favored to win after reeling off victories in five of their past six games and playing on their home field where they were unbeaten this season, many expected the Bengals to finally put an end to a 23-year wait since the franchise’s most recent postseason victory. "We felt like this was the year — and now next year’s going to be the year," said wide receiver Marvin Jones, who had 12 catches for 130 yards. "We’ll hear it for another year. And deservedly so." The Chargers blitzed the Bengals 20-0 in the second half, discouraging a sodden crowd of 62,277 that had flooded the surrounding parking lots and businesses before the game, confident that they would see some history. In a way, they did. It marked the third year in a row that the Bengals had been knocked out in their first game, tying an NFL mark for futility according to STATS, LLC. Their last playoff win was a 41-14 victory over the Houston Oilers in Riverfront Stadium on Jan. 6, 1991. The 23-year wait is tied for the sixth-longest drought in NFL history. The Bengals have had 15 starting quarterbacks since that last postseason win. The latest defeat calls into question the current starter at that position. "Obviously, quarterbacks are going to be judged on how they play in big games. 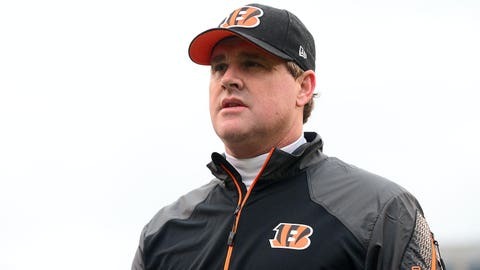 Unfortunately, the last three years we haven’t been able to win one of these playoff games, so there’s going to be a lot of criticism and talk," quarterback Andy Dalton said. "Until we win a playoff game, there’s going to be that. It’s the way it works. Until you prove people wrong, people can say whatever they want." Dalton completed 29 of 51 passes for 334 yards, but also threw two interceptions and lost a fumble as the offense continually bumbled in the second half. The Bengals, the AFC North champs, had four turnovers to all but hand the game to the Chargers (10-7). 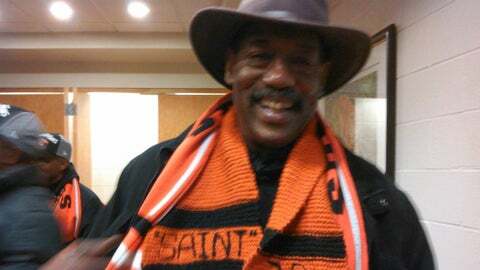 Coach Marvin Lewis, who fell to 0-5 in the playoffs, refused to believe that the early exits have gotten into the Bengals’ heads. "These players, their memory is so short-lived," he said. "I wish I could say there was that much carry-over, because there would be that much carry-over all the time for the positives. You’re starting from scratch all the time." The fans didn’t handle the defeat well. As the rain increased in intensity in the second half, a steady flow of them departed the stadium. By the time San Diego’s Ronnie Brown burst through a big hole for a 58-yard touchdown in the final minutes, the stadium was all but empty. One reason for the optimism by the Bengals and their faithful was that they had already beaten the Chargers in San Diego. Cincinnati’s defense forced three turnovers in a 17-10 win on Dec. 1. The turnovers went the other way in the rematch, with the Bengals continually making costly mistakes. The Bengals tied it at 7 when Dalton hit tight end Jermaine Gresham on a 4-yard pass. But just about everything the Bengals did offensively after that ended badly. They were driving for a go-ahead touchdown in the second quarter when Dalton found Giovani Bernard over the middle. He gathered the ball, turned and took two steps inside the Chargers 5 when he was hit from behind by inside linebacker Donald Butler, the ball squirting into the end zone where San Diego’s Richard Marshall recovered. Instead of going ahead, the Bengals gave the ball up. "The truth is we deserve the criticism," offensive lineman Andrew Whitworth said. "It falls on everybody. Everyone got frustrated. Coming in we expected to play well. We’re going to get criticized and we deserve it." Still, Cincinnati took a 10-7 lead on Mike Nugent’s field goal on the final play of the half. The Chargers took the lead for good on Philip Rivers’ 4-yard fade route to tight end Ladarius Green — who stands 6-foot-6 and weighs 240 pounds and reached over 5-11, 197-pound Chris Crocker to make the catch. Dalton then tried to make a play and was straining for an extra yard or 2 on a scramble when he fumbled the ball. That led to Nick Novak’s 25-yard field goal for a 17-10 San Diego lead. The lead wasn’t insurmountable, but it certainly was the way the Bengals’ sputtering offense was playing. Four plays later, Dalton short-armed a pass into the right flat that Shareece Wright picked off at the Cincinnati 30. Novak converted again, this time from 23 yards, to make it 20-10. Dalton then turned right around and threw yet another interception, this one to Melvin Ingram. However, the Cincinnati defense stiffened and prevented the lead from growing. But by then it was too late. So much for a solid season, a division title, all those strong showings. "The last two years we were hoping to win. This year, we went in knowing we could win," wide receiver A.J. Green said. "That’s the most hurtful." Notes: It was San Diego’s first playoff win since a 23-17 overtime victory over the Colts in 2008 and its first road playoff win in an open-air stadium since a 17-13 victory in Pittsburgh for the 1994 AFC title. … The Chargers ran for a season-high 196 yards. They’ve rushed for at least 144 yards in each of their past five games. … Marvin Jones caught eight passes for 130 yards, a Bengals playoff record. A.J. Green was limited to three catches for 34 yards.